All that is needed in the Thai daily fresh on the market offers. At any time of day may, in Thailand be purchased. 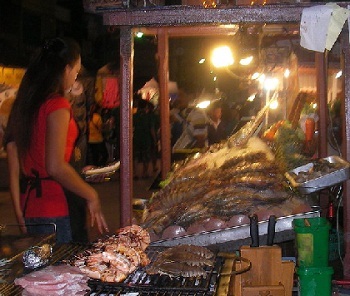 The stores' 7 / 11 "is open 24 hours, but are more popular traditional markets. These markets only at certain times and some only open on certain days. 77110 Amphur Hua Hin, Prachuabkirikhan Bonita Hua Hin. We supply home and commercial use products make your life more pleasant. 77110 Hua Hin, Prachuabkhirikhan Mini Farm is truly a perfect place in Hua Hin where you can find a wide variety of fresh temperate vegetables and fruits, and all types of ingredients for western-style cooking. It is a paradise for chefs and cooking lovers. 77110 Hua Hin, Schweizer Wurstspezialitäten, Bratwürste, Cervelat, Wienerli, Schüblig, Rauchwurst, Mostbröckli, geräucherter- und getrockneter Rohschinken. 77110 Hua Hin, Prachuabkhirikhan Retail Distribution Center , Acer, Dell, Asus, Toshiba, Hp, Zyxel, Nokia and Smartphone.